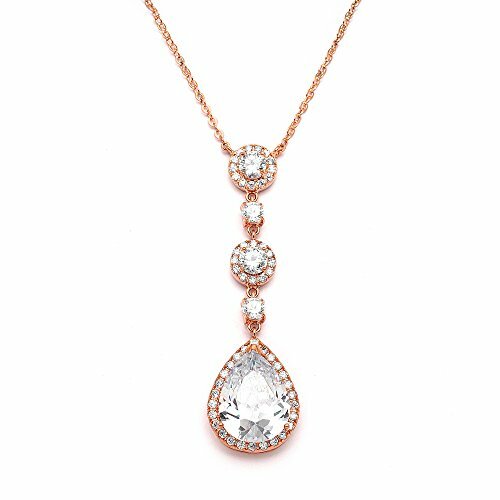 Make a dazzling grand entrance in Mariell's fiery Cubic Zirconia teardrop statement pendant glistening with precision-cut Pear-shaped and Round-cut Halo CZ gems plated in Genuine 14KT Rose Gold. Add vintage glam to Blush wedding gowns, bridesmaids dresses and your special occasion wardrobe with the endless sparkle of our AAAAA grade CZ with the look of priceless fine jewelry. With intricate pave details, Blush Pink Rose Gold plating, and its adjustable 16" - 18" chain, our breathtaking 2 1/4" h necklace pendant makes an impressive gift and a fabulous addition to your jewelry collection. We love the eclectic silhouette of this heirloom-inspired jewelry with the decidedly contemporary flair of on-trend Rose Gold plating. After your special occasion frocks are neatly tucked back in the closet, slip on this popular beauty with your business wardrobe or add a splash of elegant bling to your Saturday nights on the town. Who needs diamonds when you can buy this breathtaking jewelry for a fraction of the price. And don't miss the Mariell Designs coordinating styles 400E-RG or 400EC-RG to create a head-turning ensemble. We promise you'll adore this top selling stunner or your Money-Back. Treat yourself or someone you love to some seriously gorgeous sparkle at a fabulous low price. Enjoy Mariell's exclusive 100% Risk-Free Purchase and Lifetime Guarantee.